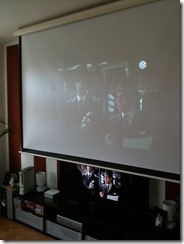 I know this post is a little bit "offtopic" but I´m sure that almost every developer/nerd dreams of his own cinema at home. After I was asked at Twitter about my own solution I thought it would be a good Idea to blog about it. I´ve marked them red in the picture below. These are marked blue and green. A special role plays the HDMI switch I´m going to talk about later. Like you may see on the picture: it´s not the smallest one. But this wasn´t important for me anyway because I´ve planned to place it on the ceiling. 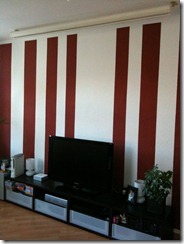 Also I´ve bought a fitting screen. I´ve assembled the screen at the ceiling with an bracket (with the help of someone because I´m not the king of homework ) . I´ve found out, that the Lens-Shift function is very practicable to arrange the picture generous. 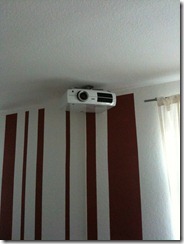 I´ve fixed the beamer with this ceiling bracket at my (plasterboard) ceiling and it works till today . Of course you can hear the beamer working - it´s almost like the sound of the Xbox 360 (the old ones) - it´s a bit irritating at very quiet scenes if you are concentrated on it. I didn´t recognize any kinds of trouble with the picture. Also there is now rainbow effect till now. But I can´t recommend you to use it at daylight. The colors are extremely pale even if you change the configurations. I´ve tried to avoid the annoying cable changes every time I want to use the beamer. I thought the solution is this HDMI Switch. There are 4 HDMI Inputs and 2 HDMI Outputs + a TOS-Link exit for the sound. The gadget is able to use both exist at the same time (if you need this). Only disadvantages: It´s extremely ugly with the red LEDs and the cables on three sides . You can´t conceal it totally because the remote control needs to stay in contact with the gadget. 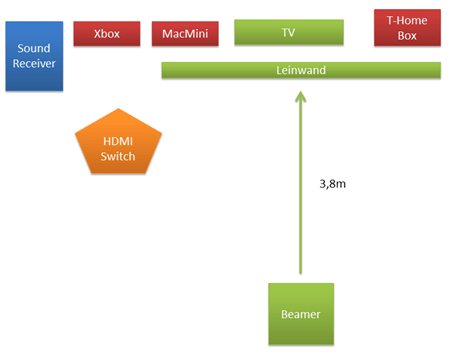 For the connection between HDMI Switch and beamer I´ve used a very cheap 10m HDMI cable. My other gadgets didn´t like this but it was okay for the beamer Otherwise take a look on the Amazon Basics HDMI cable, I absolutely recommend them to you.